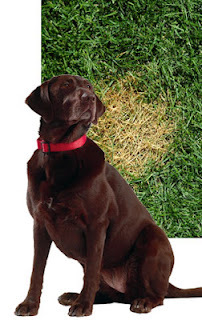 Why does dog urine cause brown spots on grass? Grass burns from dog urine are a source of frustration for dog owners who take pride in a beautiful lawn. Brown or yellow spots of dead grass are unsightly, but some dog owners feel that it's just part of living with dogs. In fact, there are ways to prevent grass burns from dog urine. While nitrogen is an essential component in healthy soil, high concentrations of it can cause grass to turn yellow or brown. Urine is naturally high in nitrogen and alone can cause grass burns. However, lawn fertilizer also contains nitrogen. An excess of either or a combination of urine and fertilizer may result in an overdose of nitrogen, thus "burning" the grass. Salts and other compounds in dog urine may also contribute to grass burn. In addition, highly acidic or alkaline urine may alter pH of the soil in that area of your yard, adversely affecting the grass there. It may seem like female dog urine causes more trouble to the lawn than male dog urine. This is simply because most females tend to squat and urinate in one place, while many males lift the leg and "mark" upright objects in multiple locations. The composition of a dog's urine does not vary that much between male and female dogs, especially when spayed or neutered. Train your dog to urinate in one area and plant a urine-resistant ground covering in that area. One great option for this is clover. You might also try creating a dog-friendly landscape in your entire yard. Give your dog a supplement or food additive that is designed to neutralize the nitrogen in the urine. One example of this type of product is Naturvet Grass Saver (compare prices). As always, ask your vet before starting any supplement. Additionally, never attempt to alter your dog's urine pH unless specifically recommended by your vet. Immediately after your dog urinates, use a garden hose to rinse off the area. You might also consider switching to a low-nitrogen fertilizer for your lawn (make sure it's pet-safe too). Remember that other animals might have access to your yard and their urine can cause lawn damage as well. A fence will keep out any dogs passing by, but cats and various wild animals are not so easy to stop. This may or may not explained continued brown or yellow spots in the yard after implementing the above recommendations.